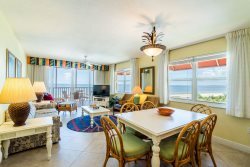 Located within Polynesian Vacation Villas, #7 is a second level studio condo that is sure to provide you with everything that you need for a short stay or an extended getaway! With wood laminate and tile throughout, this studio has a fully equipped kitchen and a full bathroom. Accommodating up to 4 guests, this unit is equipped with a queen size bed and a full size sleeper sofa. Outside you can sit back, relax, and enjoy partial gulf views from the covered deck with patio furniture! An onsite laundry facility is available for use and private parking is provided! Just steps from your front door, you will find the 7-mile stretch of pristine sugar-sand beach! Right across the street you will find a Armando's Day Spa, Shamrock Irish Pub, the famous "Heavenly Biscuit", and more. Just 1/2 mile north (a short walk or quick trolley ride away) you will be sure to enjoy downtown Times Square and the famous pier, along with many local shops, restaurants, and island activities!